The conservative and the optimistic approaches of distributed discrete event simulation (DDES) are used as the starting point to develop an optimized simulation framework for studying the behaviour of large and complex timed transition Petri net (TTPN) models. This work systematically investigates the interdependencies among the DDES strategy (conservative, Time Warp) and the spatial decomposition of TTPNs into logical processes to be run concurrently on individual processing nodes in a message passing and shared memory multiprocessor environment. Partitioning heuristics are developed taking into account the structural properties of the TTPN model, and the simulation strategy is tuned accordingly in order to attain the maximum computational speedup. Implementations of the simulation framework have been undertaken for the Intel iPSC/860 hypercube, the Sequent Balance and a Transputer based multiprocessor. 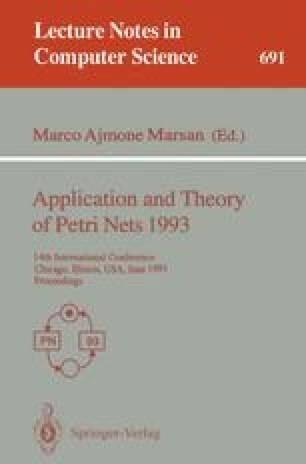 The simulation results show that the use of the Petri net formalism allows an automatic extraction of the parallelism and causality relations inherent to the model. The work at the University of Torino was performed in the framework of the Esprit BRA Project No.7269, QMIPS. The work at the University of Vienna was financially supported by the Austrian Ministry for Science and Research under Grant GZ 613.525/2-26/90.